In the mid noughties I began to delve deeper into soul music, the latest genre to grab my attention in an ongoing bid to expand my musical horizons. And like most of these adventures the results proved revelatory! I fell for The Temptations and learned that Otis Redding really was as good as everyone claimed. I was blown away by Aretha, marveled at the discovery of Sly and the Family Stone and came to the shocking realization that Stevie Wonder wasn’t crap after all (go easy on me, I’d only really heard his 80s output up until that point). My mum and dad were both into Marvin Gaye, so I’d grown up with his tunes reverberating around the house, particularly his poppy love duets with Diana Ross and Tammi Terrell. 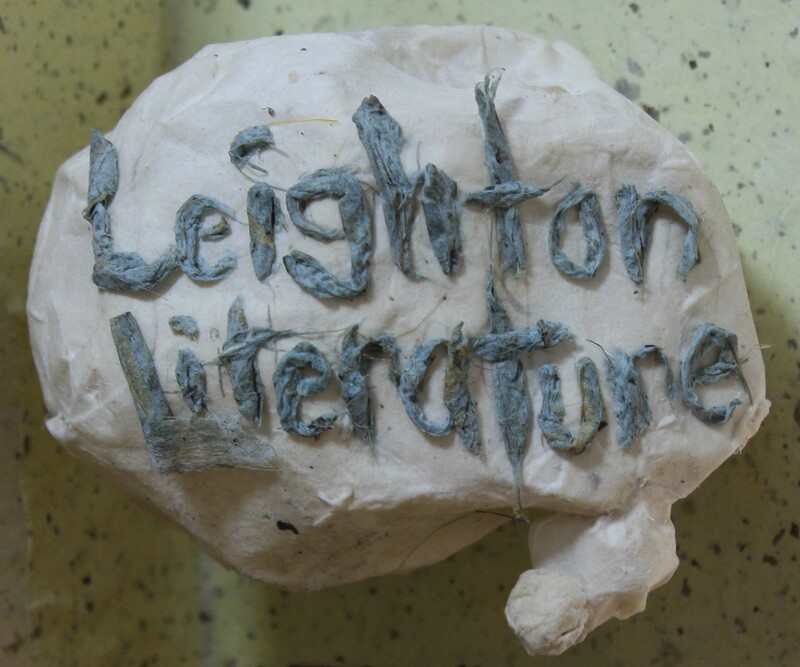 But I’d never heard much of his later, more mature work shall we say. In fact, it was a lazy, magazine-reading Sunday afternoon in 2005, maybe 2006 that What’s Going On showed up in a Top 100 Albums list for the zillionth time. On this occasion something clicked and at long last I took a stroll down to my local record shop and picked up a copy for myself to see what all the fuss was about. 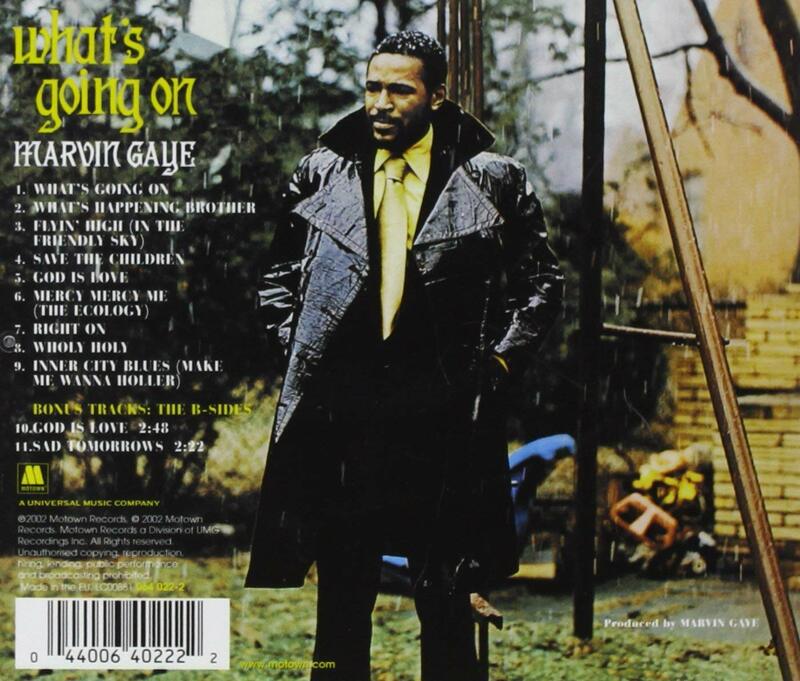 Released in May 1971, the album marked a dramatic change of style for Marvin, who’d become deeply disillusioned with the social ills plaguing The United States. Told from the perspective of a war veteran returning home from Vietnam (his brother Frankie), What’s Going On casts a sad eye over a broken country, touching on issues of war, police brutality, civil rights, poverty and the environment. The first time I listened to it I was stunned by what is essentially an exquisite vocal performance. With its sublime melodies and lush arrangements the opening title track sets the mood, Marvin’s angelic vocals echoing and interweaving in a direct plea to the police. ‘‘Picket lines and picket signs, don’t punish me with brutality. Talk to me… so you can see… what’s going on’’. Although this is a record steeped in the politics of the times, Gaye himself was never much of a political animal and here he stakes no claim to fully comprehend the issues at hand. ‘‘Say man, I just don’t understand what’s going on across this land’’ he cries on the tender What’s Happening Brother. On Flyin’ High (In The Friendly Sky) meanwhile he merely opts to tune out of the whole mess by slipping into a heroin-induced daze. ‘‘And I go to the place where the good feeling awaits me, self-destruction’s in my hand’’. Lyrically it’s a harrowing window into just one of the man’s demons, although it has to be said that as a listener the sound of Gaye getting messed up on drugs is just gorgeous. 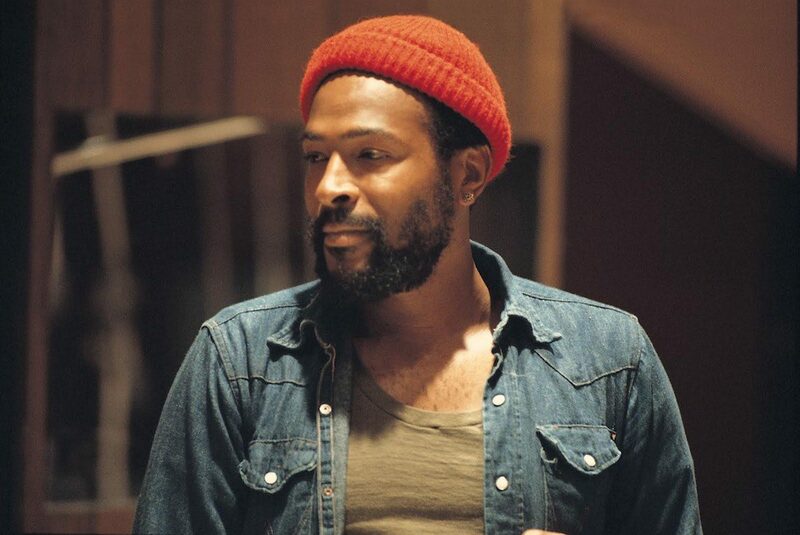 Marvin Gaye: A man with an exquisite voice and crippling demons. With a narrative that’s perhaps not as insightful as some of his peers and with no solutions thrown onto the table, Gaye’s message is simply one of empathy, a call to all for understanding and mutual respect. It’s a sentiment often channelled through his love for God. Whether the listener is religious or not this can be sweet and genuinely affecting, as on God Is Love where Marvin implores us to understand that ‘‘all he asks of us is that we give each other love”. But elsewhere it feels a little grating and insipid, as on the lyrically naïve Save the Children, a track so sickly and trite it has you pining for Michael Jackson’s Earth Song. Thankfully the outstanding Mercy Mercy Me (The Ecology) more than makes up for it. ‘‘Where did all the blue skies go? Poison is the wind that blows from the north and south and east’’. An ode to environmental decay long before the subject truly gripped the world’s attention, vocally this is Gaye at his most plaintive on an anthem of regret and sorrow. Things get decidedly funkier with the head-nodding grooves of Right On, a look at the various divisions of humanity. Encompassing race, class, good and evil, Gaye is virtually swaggering as he sings ‘‘Some of us were born with money to spend, some of us were born for races to win’’. With its loose arrangement, wondrous flute solo and jazzy piano it’s a welcome change of mood for an album which can at times feel a little samey. Segueing into the solemn and preachy Wholy Holy, Marvin urges ‘‘Everybody together, together and holy will holler love across the nation’’ amid slick orchestrations and a sleepy saxophone. It’s the album’s slowest track by some distance, which sets things up nicely for the grand finale. And what a finale it is! Album closer Inner City Blues (Make me Wanna Holler) is the record’s jewel in the crown. ‘‘Crime is increasing, trigger happy policing, panic is spreading, god knows where we’re heading’’. With its bongo-driven rhythm and menacing undercurrent this it’s the closest Gaye comes to showing any kind of anger. But fear not, he’d be saving all that fury up for a later record, 1978’s bitter divorce album Here, My Dear. In addition to being one of the most beautiful records I’ve ever heard, What’s Going On also stands as among the most cohesive. With a seamless transition between tracks the whole affair flows effortlessly like one continuous song. For Gaye’s detractors however this is seen as the album’s problem, with some claiming his admittedly superb performance throughout is somewhat undermined by an overly shiny production. Then there’s his incessant Christianity-trumpeting, another alienating factor for non-believers. It can also be argued that lyrically What’s Going On is nowhere near as profound as music history dictates. Marvin was always a deeply personal writer and performer and here the political narrative often gets swallowed up in the man’s own ego and personal woes. But for me this is what makes Gaye stand out, he was always a man who wore his heart on his sleeve and his music was warts and all. In any case a lot of these points are just pure subtext. For me What’s Going On is all about that incredible voice, which is at times so pure and heartfelt everything else feels secondary. To grumble about a lackluster lyric here and there or begrudge Marvin his love for Jesus seems a little churlish. Just sit back, drink in this amazing record and marvel at one of the greatest voices popular music has ever heard. Choice Quote: ‘‘With the world exploding around me, how am I supposed to keep singing love songs?’’. – Marvin Gaye. Choice Lyric: ‘‘Rockets, moon shots, spend it on the have-nots. Money, we make it, ‘fore we see it you’ll take it’’. – From Inner City Blues. Like this? Marvin Gaye was a deeply complex and troubled man. Anyone with even a passing interest in his music will find an amazing story through Divided Soul, a biography by David Ritz. Baptism of Fire – a short story from Qatar. you were right about several things – namely inner city is best track and save the children horrible. i can see why its so highly rated given the subject matter and time of release.